'If you don't have 30 kids (on your roster) you shouldn't be allowed to play 11-man football,' says Jack Cosgrove of Colby. 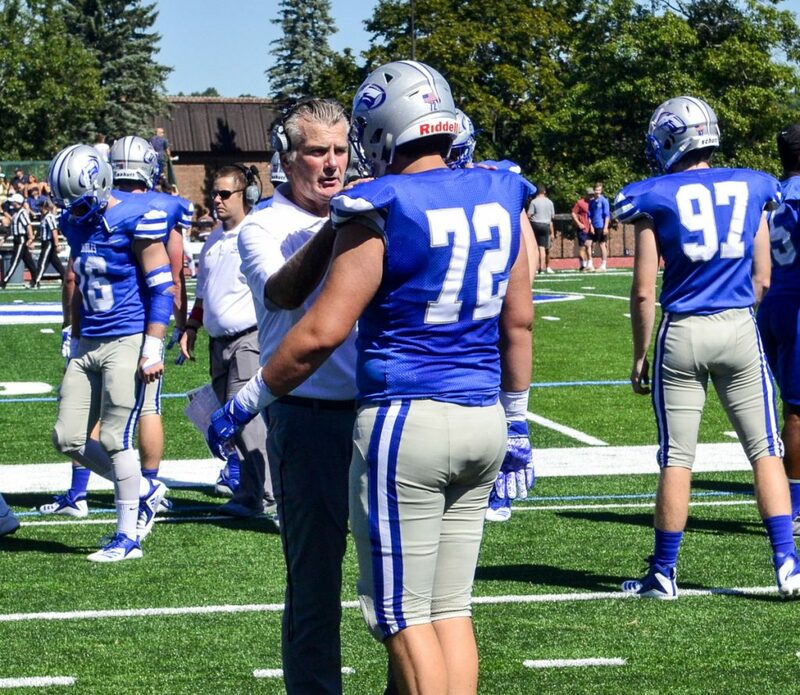 Staff photo by Joe Phelan New Colby College head football coach Jack Cosgrove talks with a player before a game against Trinity on Saturday in Waterville. An organization of prominent football coaches in Maine has thrown its support behind eight-man high school football. “To our group, eight-man football is better than no-man football and I think that’s what communities have to come to grips with,” said Colby College Coach Jack Cosgrove, president of Maine’s chapter of the National Football Foundation. Cosgrove said the group will do its part by offering financial support for eight-man coaching clinics. The group made the unanimous decision to publicly support eight-man football at its Wednesday meeting, one day after the Maine Principals’ Association released a proposal for two divisions for eight-man football next fall. Some of the 20 schools placed in the eight-man divisions, including Cape Elizabeth and Freeport, intend to remain 11-man teams. Others such as Yarmouth and Old Orchard Beach have indicated they will shift to eight-man football in 2019. The MPA does not have a roster minimum for 11-man football but recommends no fewer than 20 players. Maine’s National Football Foundation chapter includes Cosgrove, Gabby Price of Husson and Mike Lichten of the University of New England, and retired coaches such as Walter Abbott (UMaine), Howard Vandersea (Bowdoin), Pete Cooper (Lawrence High) and Mike Bailey (Portland High). The group also went on record in support of playing flag football until players reach adolesence. Cosgrove said eight-man and flag football are not new topics among coaches. They know fewer kids play football. Nationally, football players age 6 to 12 declined by nearly 17 percent from 2010 to 2017, according to the Sports & Fitness Industry Association. The number of high school football players in Maine declined 16.9 percent between 2008 and 2017. “It’s nothing new for anybody, the concern for safety. The dramatic impact of concussion knowledge and the sharing of that information related to concussions has gotten the attention of parents,” Cosgrove said. What has changed is the Maine NFF chapter now publicly says there are options to 11-man football and, particularly for small schools, eight-man is a better option. “We’re all for young boys playing football and reaping the benefits of the game, and no one ever seems to mention that football is a positive thing. Sometimes that’s lost in the equation,” said Vandersea, Bowdoin’s coach from 1984-2000.